Last night’s Alabama Dance Theater’s production of Beauty and the Beast at Troy University’s Davis Theater in Montgomery, Alabama helped me to realize why it is my favorite fairy tale. I relate to and value the numerous moral themes and life lessons to be gained from it. As I highlighted this show in my last blog, great stories have existed for centuries around the world. Their venue or means of communicating them as well as the details can vary. I’ve yet to ask Choreographer, Sara Sanford, which version she based her ballet on. I know it varies from Lang’s and Disney’s, but it highlights so many key lessons and takes such wonderful artist privilege to create a fantastic show! In the first scene, Raul Peinado, the prince turned beast, portrays too well the selfish and indifference that some of privileged descent or in leadership position portray towards the sick, poor, and hurting in society. What makes the story a “fairy tale” is that the Enchantress gives him a rightful sentence to teach him to rule himself and his kingdom better. Too bad this doesn’t happen in real life, but that does not negate the importance of using this part of the story for instruction. We parents and teachers ought to do better in identifying when our children act this way. It’s part of our base human nature to bully others who are less fortunate than ourselves especially because they may mirror a selfish indulgence that we do not want to admit. We push blame on the lowly as if they deserved their sad lot in life. Some might have made poor choices, but many have not. They were born into poverty and are struggling with no hope to get out of it. The prince must face the ugliness of his heart and face daily in the mirror what he is like. He is a beast. He acts out in anger, but slowly accepts his due and learns to love through his relationship with Beauty. The four flirts of The Huntsman, commonly known as Gaston, care only for the skin deep appearance. Even after being dropped by “Gaston”, one still chases after him. What foolish behavior! Yet so many take back “their man” or “their woman” or “their friend” time and time again after being treated poorly by them. This scene is great fodder to discuss with tweens and teens what is good and bad in any personal relationship. What I love is that Beauty sets firm limits with the Beast. She does not tolerate his angry antics. It is only when he treats her with compassion, care, and concern that her heart is converted to trust him. More would do well if they followed this course. But too many follow the foolish direction of the flirts. Beauty even sets limits with her father and insists on going back to the Beast. Emotional limit setting is something too few are taught. In Proverbs 4:23 the pinnacle of wise advise is to guard one’s heart. A sick elderly parent certainly pulls on one’s heart strings. Beauty is forced to make a choice. It’s not a simple decision. Life rarely offers those. It’s a challenging balancing act. It’s not that she’s indifferent to her father, but she must be true to a higher calling, the truth of her word and acting on behalf of a friend’s life who is at risk. Gaston further incites terrible misunderstanding of who the Beast is through fear in the townspeople. He seizes the opportunity to make himself look better by taking matters into his own hands. Too often this is what individuals do. They use ignorance and fear to manipulate others in order to boost a self-serving agenda. Back to the Beast. He demonstrated trust that Beauty would return. He had finally learned to love. So in closing, let us consider what lessons we will head. And thanks Ms. Kitty, the Alabama Dance Theater, all the dancers, parents, and supporters for a wonderful performance. Two more will occur today and tomorrow at 2:30 PM. Click Alabama Dance Theatre for tickets and enjoy the show! Most conjure up Disney’s Movies when they hear Beauty and the Beast. The Walt Disney Company has become synonymous with success world wide, but first kindly keep in perspective that its marketing power in Modern Western Culture has almost obliterated the ability to learn otherwise. Please understand, I love Walt Disney and most Disney products. I’ve yet to finish reading this 1966 Children’s Biography published by Grosset & Dunlap, In & Rutledge Books, Inc. What I’ve read so far reinforce my admiration for Walt. He inspires and encourages others to heal and grow through what all the great composers and artists did: the performing and visual arts. What I don’t like is how some limit their views of the world through their first understanding and impression of something. 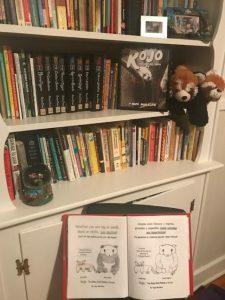 I suppose that’s why I wrote about it in my book Rojo The Baby Red Panda at the Zoo. James Deutsh wrote in the Smithsonian in March of 2017 eloquently on the world history behind this classic tale of Beauty and the Beast. This story has circulated the world orally throughout time the same as various versions of Cinderella, Snow White and others. Montgomery, Alabama recently had the pleasure of hosting A Korean Cinderella through AKeep. These stories are classics world wide because we as humans share a terrible condition of a propensity to serve self at the expense of others. Much time and attention must be spent cultivating fine character in youngsters. It is through these stories that one can learn what true love is and how to lead a family, tribe, or kingdom. Books and movies didn’t always exist. Many where masters at passing history, teaching, and morals through oral story telling. I dare to say that in our narcissistic attention deficit culture of me centered thinking, fast food, and pushing of electronic buttons that we’ve become foolishly arrogant towards cultures and history of the past. Perhaps we could stand to learn some lessons from the beast. Well there’s a great opportunity March 1-3, 2019 at the Davis Theater to do just that here in Montgomery, Alabama. Even better is the venue. First allow me to shed some back ground on this particular version of Beauty and the Beast. Sara Sandford is a former student and now teacher at Alabama Dance Theater. She choreographed all the dances to be performed by mostly local students at ADT. More importantly is how she teaches and instructs. “Beauty from within” is the slogan that was handed out to each dancer with a mirror illustrating a photo of their performance buddy rather than a reflection to self to preoccupy with. Mirrors are funny. They can serve as a means to overly dwell on one’s appearances. Or they can serve as a way to direct our attention to clean a milk mustache, see that the dress doesn’t look good, or tame a wild hair causing unnecessary distraction or attention to self. They are very important in dance. The instant feedback helps each dancer to discipline their body parts to conform to each move they’re trying to complete. What I’ve come to love about ADT is this culture in which they teach the children. Respect, manners, and discipline dictate in a way that fosters encouragement to the youngest and most unlikely student of dance. This is what the performing and visual arts are supposed to be about: uplifting the downtrodden human spirit and encouraging it to grow beyond self-centered pity. So, take an opportunity to reflect on the deep messages and lessons to be learned from ADT’s Beauty and the Beast. And enjoy the fantastic costumes and dancing. click on this green link here for a blank copy of this RojoValentinesDay (1) illustrated here. Please forward to 1st-3rd Grade teachers who want to include a great message with a phonics lesson into their Valentine’s Day celebration at school or in their children’s ministry. Thank you! Some of us are recovering from job losses. Art is a great way to work through grief. Social media abounds with promises for book writing and entrepreneurial opportunities. So, I’ve been slugging away at it for over six years. Here is how it started. The icon of the Smithsonian National Zoo on Connecticut Avenue in Washington, D.C. is the Giant Panda. In fact, I think it may have overturned the famous portrait of George Washington and may even be the icon for the entire Smithsonian as a whole if my memory serves me right. So, one can some what empathize with the poorly informed visitors of their expectations. But, I learned something new that caught my attention. These adorable balls of fluff were the first to be named panda, not the giant pandas! So, I parked my stroller closer to the viewing area and listened closely. Then I questioned, what if these two critters could hear these comments? Would they take offense like my 8th grade students do in public school? That evening before bed, I asked my husband if it would bother him if I stay up huddle over my computer next to him to write out this story that came to me. That night I scoured over the Internet researching to learn more about these animals because the gift shop only had books on giant pandas. As I learned more, I typed away an allegory or parable for my daughter of many lessons I had learned the hard way through broken dreams, relationship and job losses, and bouts of depression. I was also concerned that in less than 10 years she would be struggling like many of my students because her genes express mixed race. I like most parents wanted to give my daughter a better future. But the future I was thinking about was an healthier outlook resilient to anxiety and depression, not a bigger and more secure paycheck. Even though I was a big believer in the asthma and allergy products that I represented for a major pharmaceutical company for 9 years previous to my return to teaching public school, as a patient, I had no relief from various classes of different anti-depressants I tried. Each one seemed to exacerbate anxiety and suicidal thoughts except one of which numbed my pain and ability to think deeply which eventually caused a potentially life threatening rash. I was absolutely clueless as to why I struggled with so much depression. Overall, I loved life, had good opportunities, and enjoyed a wide variety of activities. I read my Bible daily since I was in the 3rd grade. It didn’t make sense. The spiritual experience that strengthen me in middle school that I write about in my August 28, 2016 blog wasn’t giving me the joy that I once knew. Honestly, I felt pretty happy during those middle school years unlike most. However, what took a toll on me was hearing my mother go on for hours on the phone with dramatic prayer requests regarding my situation. I need to clarify that I’m not trying to blame my mother right now. From what I’ve been able to piece together, she was doing all she knew and was taught to do. Her parents were very religious individuals in a church that has a history of being pretty emotionally and religiously abusive. This is really hard to unravel for those of us that love God at an early age and buy certain explanations of how to interpret, “Honor thy father and mother.” “Pray for your leaders.” “Respect those in authority.” It can behave like the perfect combination to set one up to co-depend upon others. It also ensures plenty of compliant individuals for bad leadership to dominate with their corrupt authority, otherwise known as narcissistic bullies. The other problem that occurs is where the expression, “Do as I say, not as I do” comes into play. My mother came to Jesus soon after I was born. So I was the child who she nursed with Bible Stories, songs, and prayers. However, her default behavior was to mirror her parents behaviors which were to live in complete fear of an angry God who will punish you if you don’t comply. They faithfully attended all services at their church, ran a strict religious home, and lived in fear of poverty and concentration camps. They didn’t live in freedom of the joy of the Lord. Rather, they over worked to try to fit in a small town and persuade people they were on America’s side. To complicate things further, my mother grew up loving many of the religious practices in her home. They provided a sense of identity, some joy, and love that was shared in her family. But they were culturally strange to my father and his parents. To make matters worse, my father was taught to love others through an abusive form of humor: making fun of them. Yes, my father truly believes that you make fun of those that you love. And many others do too. It wasn’t until the late Dr. Elda Arce, M.D. Assistant Professor of Adolescent Medicine at Children’t National Medical Center that I learned that it is teasing can be a form of emotional abuse. Dr. Arce was born in Peru. She had a special respect and concern for me. I earned her respect as a peer in the area of asthma and allergies. I was trained to be a medical liaison for an American pharmaceutical company that spent millions of dollars into research to find alternative therapies for asthma. However, liver studies revealed safety concerns and reality that these drugs would not be recovering any of their investment in the market. So I jumped ship and returned to medical center sales for an International pharmaceutical company who had products already on the market with more promising they would follow. This is how I met and became friends with Elda. What I loved about my friendship with Dr. Arce was that she could clearly see, identify, label, and deal with the flaws of American culture because it wasn’t her native one. However, she embraced it, loved it, and was committed to improving it not just for her own sons and each and every patient she treated. She cared about me. At the time, I was a pharmaceutical representative, some one that frequently was disdained and blamed for high prescription drug costs at cocktail parties. I’ve mentioned before there is a common trait that unites all humans that no one wants to embrace. Naked we come into the world with a selfish propensity and desire to self-preserve at the cost of others. How that impacts each culture varies. For me, what I’ve learned and say as a motto is, “Everyone is getting something right and everyone is getting something wrong.” Therefore, I seek opportunities for cross-cultural experiences to see what they might be doing that I’m not that I’d like to try. One of the experiences I was looking for was a Black Christian Church service. And Wanda made that easy. to post on my book, Rojo, The Baby Red Panda at the Zoo, Face Book page for the upcoming National Holiday. Wanda came out of the church and invited us to the Dr. Martin Luther King, Jr.’s 90th Birthday Celebration while she hopped into her car to head out for the day. Well, not only did she do that, but she opened the door yesterday morning and welcomed my daughter and I with the warmest hugs. We arrived early to ensure we got parking and a seat. But it was really early, so we followed Wanda back down the stairs where she introduced me to Docent Brenda. Brenda proceeded to choose really well. She focused on educating and encouraging me and let the other ladies put my daughter to work in setting up the tables to receive lots of visitors. First, we got chatting about the March books (depicted above) I had packed to keep my daughter busy while we waited. Brenda had just seen a PBS special the evening prior discussing these books. I had purchased volumes 1 & 3 at The Freedom Riders Museum last year when I learned about it after my daughter re-enacted as a Creek Indian at Alabama Frontier Days while we were still traveling in our RV from our evacuation from Hurricane Irma in South Florida. Then we moved on to so many other topics. What moved me most, is Brenda validated the racism I experienced at the hands of a former Chinese’s boyfriend’s parents who ended our relationship because I wasn’t Chinese. This docent wasn’t indifferent like so many of my own kind have been to the troubles I’ve experienced in my life. She cared. We bonded. And then before I knew it we had to scamper quickly up the stairs before no more seats were left because we talked too long. In route, I noticed a beautifully painted mural on the wall that covers a significant time period in Dr. Martin Luther King Jr.’s life. I pulled out my cell phone and snapped a picture faster than I could read the sign that my daughter embarrassed had to inform me stated, “No pictures of the mural.” What happen next amazed me. Nothing. No one yelled at me. Do you know what happens to them when they break a rule??? Instead, they saw and continued to greet me with a smile. Now, I’m going to mind my manners and not post that photo here. Instead, I’m going to invite you to go visit Dexter Avenue King Memorial Baptist Church in Montgomery, Alabama to see it for yourself because it took the artist over 2 years to complete it. It’s not something a photo can do justice of. All the puzzle pieces in my head connected. These statements are absolutely true. Why else did Vivien Thomas experience what he did in his life especially when he moved his wife and young family to Baltimore Maryland to join Dr. Blalock at Johns Hopkins? Why did I hear my dad and grandparent make certain derogatory comments when I grew up in the North who was supposed to fight in the Civil War against Black slavery in the South? Why did I feel that I had better not come home with a black boyfriend even though one of the earliest songs my mom taught me was Jesus Loves the Little Children? Why could I not locate There is a Balm in Gilead in the old Lutheran and Presbyterian Hymnals that I have? Let me get back to waiting for the service to begin. A family of several women, three young children, and a man asked if they could sit next to us. After they squeezed in, I felt selfish that I had more leg room at the end of the pew than this big man. His knees extended right into the pew in front. I asked him if he wanted to switch for more comfort and he declined. He was fine. Wow,! That wasn’t how I got treated on a bus by a professional male in Philadelphia when he indignantly continued to read his newspaper comfortably in his seat while my 5 year old daughter and I stood dangerously in the aisle in the front of the bus a few years ago. Since it was still early before the service began, I pulled out three copies of my coloring sheets (depicted above) and my colored pencils. I offered them for his kids. He thanked me and then returned the pencils when the kids were done. The children were so well behaved and waited so patiently for 30+ minutes. (How many other young children would be so quiet and patient?) I began to realize that what my daughter said last week was true, “Mom, the blacks get it. It’s the whites that don’t.” Being very white and raised WASP myself I finally got it. This family had more to teach me than I them. So, I mustered up the courage to ask the guy if he recognized all pictured in the flyer. He did. I only recognized a few, but he knew them all. Now I recognized most of the names, but I couldn’t match the names with the faces. Why not? I wasn’t taught that it was important. But gee, go back to Vivien Thomas, where would modern surgery be today without him? So as we approach Black History Month, February, reconsider its importance and take time to learn more. For example did you know MLK Jr. was not named Martin at birth? I didn’t know until yesterday’s service. But first, back to the service. Rev. Cromwell A. Handy, Pastor, Dexter Avenue King Memorial Baptist Church led this service so beautifully. He accredited musicians to being the one who gave the strength before the historic march. He permitted the congregation to break out in song to the pianist offertory How Great Is Our God. The emphasis was on God and his greatness through a faithful servant. It was not a praise service for MLK Jr. There was also no disrespect for the current administration in Washington, slams, or innuendos. Then Dr. Shannon stepped up to the pulpit and preached on Luke 8:23-28. He emphasized that we need to stand strong. God creates out of nothing. Yet preparation is key. That’s exactly what God did through MLK Jr. he was preparing him through each phase of his childhood to do what he would do between 24 and 38 years of age. We need to correct our hermaneutics before the homily can be delivered. Too much of scripture has been misinterpreted. We need to listen to the calling of God on our lives not matter how uncomfortable it may make us. We should take heart when experiencing rejection. Because that must be experienced before a yes can be received. Don’t always look for money. You will never be comfortable until you do the will of God. You must calm down before you can be of any useful service. High emotions regarding injustice must be worked through and settled if you’re going to be effective. And in summary Galatians 3:28 we need to be one, not constantly bickering and casting stones at one another. Thank you all who were involved in this special Dr. Martin Luther King Jr.s 90th Birthday Celebration. It filled in many of the gaps and questions in my own life’s challenges and has inspired me to continue on in my art, calling, and mission which is to grow beyond beyond my childish selfish pity me and entitled ways to become emotionally healthy and spiritually mature so that I can encourage others to do likewise. A gift I gave to my daughter and self was tickets to see the end of the year shows at Alabama Shakespeare Festival. We were somewhat aware of the Sound of Music from watching the movie and listening to its accompanying sound track. I had read the Gospel of Luke several times and was quite curious what the “show” would be like. We attended the Wednesday matinee of the Sound of Music to see two of our friends acting in the cast as Von Trapp children. The stage was curiously set with hills as the floor and two fake grand pianos set back to back in the center. The female adult cast opened the doors with angelic song and the story proceeded. Courtney Bassett, Maria, won our respect and hearts quickly, but I was still distracted by the setting and the two pianists. Then Angela Dickson, Baroness Elberfeld, and Kevin Ligon, Max Detweiler, portrayed the parts of two indifferent self serving people who topped it off singing No Way to Stop It. I had no idea how different the Broadway Show was from the movie. How Can Love Survive was another unfamiliar tune with thought provoking lyrics. Enraptured by this shift of story line, I wanted to come see the show a second time. This was easy to justify because one of the girls who acted as a fellow orphan with my daughter in ASF’s production of Annie this past summer was scheduled to perform in a different cast of Von Trapp children Saturday night. I had already purchased our tickets to see the Saturday matinee of the Gospel of Luke, so sticking around for a second show would be possible. ASF upgraded our seats to the front row for the Gospel of Luke. We settled in. My daughter and I briefly discussed that this show would be very different from the Sound of Music. It was a one man show, with very few props, no fancy costumes, and no music. Bruce Kuhn deliver just that. But what surprised me was his first line was the beginning of the Gospel of John, not Luke. Immediately, I regretted not bringing my Bible to follow along to see how the story differed. My memory was all I had to rely on. I was enthralled at the opportunity to hear the Gospel of Luke, John, or mix there of in similar manner to how it actually would have been told early on. Most are unaware that original biblical scripts have no chapter or verse numbers marked much less any subtitles or headings. They are also unaware of how story telling occurred and that this is how the history and teachings were passed on from one generation to the next. Wow! my daughter and I now propelled centuries back into what their world might have been like. Unfortunately, we weren’t prepared to listen as intently as those back then would have. It was tough to stay alert and listen closely, Mr. Kuhn did a great job trying to keep our attention, but I certainly appreciated a coffee and brief walk in the park at intermission. I likened the experience somewhat to the best and longest sermon I ever heard preached . So, I came back for the second half much more in tune and ready to observe. Prior to the evening shows at ASF we stood in the waiting area behind back stage to great my daughter’s friend and parents from Annie. We were surprised when Mr. Kuhn came through the door and was happy to say, “Hello.” I enjoyed such pleasant banter with this fine actor regarding the irony that this Gospel of Luke actually starts with the Gospel of John. We proceeded to enjoy our second viewing of the Sound of Music much more as I had determined not to allow the hilly stage floor, fake grand pianos, and pianist distract me. I wished that I could have watched the Gospel of Luke a second time too, but I can’t. What I can do though is sit down and read the entire Gospel of Luke in a single sitting. And that’s exactly what we did the next day. Some get hung up on “artist’s privilege” otherwise known as the changing of the original story line to make a show. 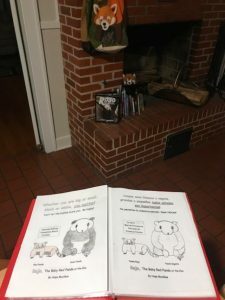 One reviewer of my book, Rojo, The Baby Red Panda at the Zoo, had issue that an Asian animal was speaking Spanish. But art is what makes the world colorful and hopefully inspires us to learn more. The Von Trapps were a real historical family and figure. How true are either the silver screen or stage versions to their experience? Even the book written about it will be slightly biased. It’s just how it goes. So, we can either get all excited about these varied perspectives in a negative combative manner or in one that inspires us to learn more from a different angle. What will you choose? *Just an interesting side note: We learned from visiting the Knoxville Zoo that there are fossil remains that have been uncovered nearby matching that of red pandas. They could actually be American! October 31st: What Holiday Do You Celebrate? Last Day of Bully Prevention Month, Reformation Day, or Halloween? *Right click on words in green font to open a link in another tab to more information about it. A left click will open the link and take you away from this tab. 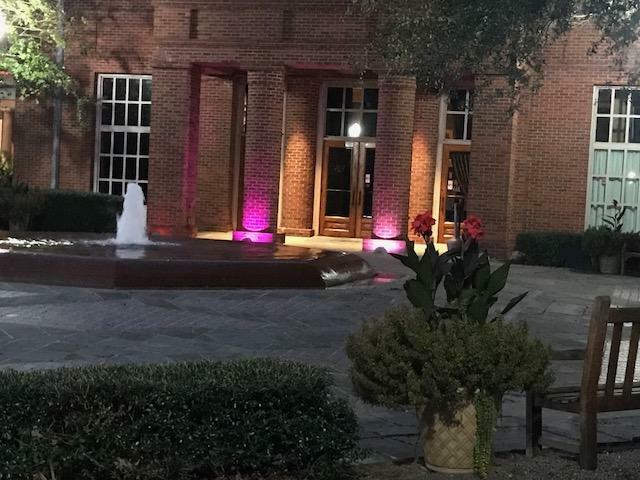 What a lovely evening I enjoyed on this park bench waiting for my daughter while she rehearsed for tech week in Alabama Dance Theater’s production of Dracula. Several conversations ended up taking place here that led to my inspiration to write this particular blog. I continued rambling on about how grateful I felt that her teacher encouraged my daughter to audition for Dracula and Mistletoe. I envisioned my tween being rejected as her dancing ability is far below from the impressive dance company girls and professionals who will perform the lead roles. Little did I think my Ballet I student would land a part as a Gypsy Villager which requires more acting than advanced ballet skills. We chatted on about how great it is for our daughters to have such encouragement and experience. So, I was surprised to listen to an upset dancer on the ride home. Here some of her little or rather younger “Gypsy Children” that she works with sassed and mocked her for only being in Ballet I. My first approach was to discuss how disrespectful our culture has become. I pointed out what kind of humor dominates the most beloved cable children’s networks. Then I pointed out that these children are much younger and therefore more immature than she. It is childish behavior that is being exhibited and rendered at her expense. I think this is why the expression “Sticks and stones may break my bones, but names will never hurt me.” has been repeated so much over generations. Children can and often behave very meanly towards one another. Especially when they are hurting and it makes them feel better about themselves when they put another child down. These two points nudged my daughter a little towards extending forgiveness and compassion towards her disrespectful gypsy children. But still her wounds gaped open with pain. I had to step into the “Mama Rojo” role from Rojo, The Baby Red Panda at the Zoo. I needed to strengthen the identity in my own child. It had been insulted and it must be restored. There’s something else that needed to be done. I had to acknowledge that it is wrong how these children behaved towards her. This is why Ruby Redfords poem, that clearly states that words can also hurt me might be a more useful and timely poem for us to recite to our children. Too often we are afraid to call out inappropriate behavior. Would it be because we’re afraid of being called a “Tattle Tale?” First, I put it on her that she needed to go to one of the adults helping with the production. Then it dawned on me… she came to me. I’m an adult. Do I have the courage to write about this in a blog and figure out a graceful way to handle this? Well obviously, you’re reading what I decided to do. In no way am I trying to pick on the children out who are mocking my daughter. But I am capitalizing on using it as an example in order to encourage other parents out there who are reading this on what we can do in this age of out of control bullying and narcissistic culture. So what? There’s a plethora of discussion regarding the various types of abuse. What I have come to believe is that emotional abuse, in particularly covert emotional abuse, is the most damaging. Many support this idea in the current blog world, but it wasn’t until last week that I realized why. It is all about getting the right diagnosis first in order to prescribe state of the art treatment. It is well established that forgiveness is one of the key remedies for one to recover from a traumatic experience. But one cannot forgive something if it’s never identified (covert) as being inappropriate behavior exhibited towards you. At least in physical abuse the evidence is obvious it is not hidden and denied. Likewise you can’t say, “no more” if the behaviors is mislabeled under the guise of love, care, or fun which abusers are masters at doing. This is the first enlightening thought that came to me. Re-establishing healthy relational boundaries is the other key ingredient to bouncing back from a negative situation. If you consider the initial approach I took with my daughter I almost excused the behavior and turned the bullies into the victims, “Oh they must not feel good about themselves because of xyz.” That might be true, but there’s a lot more that needs to be acknowledged. While it may not be polite, appropriate, or much less needed to point out others flaws and weaknesses (which we all have), this should not be confused with speaking up for oneself when personal respect boundaries have been violated. It needs to be called out for what it is: hurtful. Anything that hurts another person’s identity is wrong. The idea of the need for strong healthy boundaries comes in with the other conversation I had on that park bench. Most of the summer I passed by this exact spot with some fantastic parents of the orphan cast of Annie. One of whom helped me to see that my latest author visit invitation (which I’ve not had since May) may not be in my best interest and really an unusual draw for them to attract people to come to their event who very well may not. 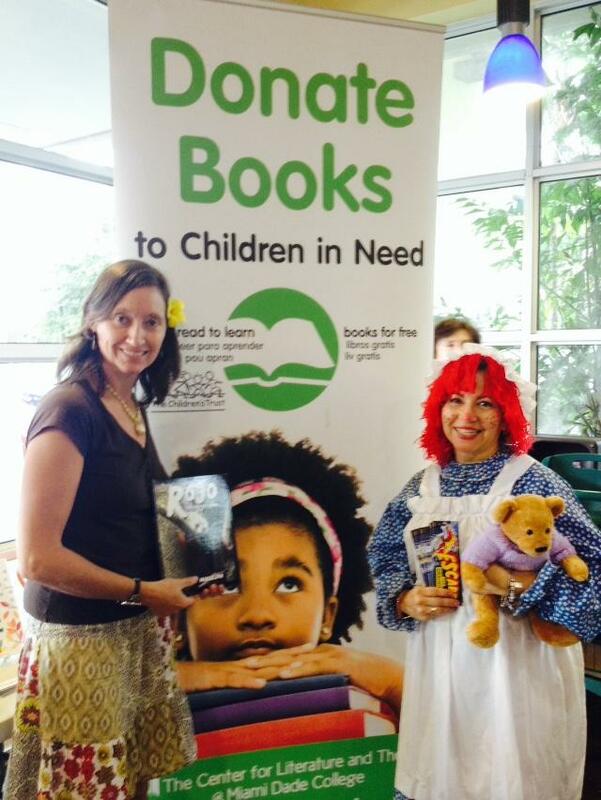 all around South Florida with the Read to Learn Books for Free Program. Back to the park bench. What I learned reading my emails was that my Annie orphan mom friend was right. This author visit invitation was not at a good time. I had expressed from the beginning that my daughter was scheduled for tech week prior to 4 performances the weekend they wanted to host me and it wasn’t a good time for me. However, I reluctantly agreed because the owner insisted on November 3, 2108 and I had been feeling desperate for an opportunity to publicly read, sell, and sign my book. I needed better boundaries and respect of my own family schedule. Do you want to guess what the answer was when I offered to reschedule for one of their December venues? Yup, “We’re sorry that won’t work.” Did it hurt? Yes, but not nearly as much as it would have if I hadn’t learned what I’m writing about. And perhaps I created this rejection because of how long I took in finally mustering the courage to request rescheduling. I don’t need to sell myself short in the hopes of an opportunity that probably isn’t going to come. Folks may be going to the venue this weekend, but they’ll most likely choose to be entertained at the many other fun activities rather than slow and quiet down to hear a book read. Watching pumpkins fired away and smashed into the field is what they’re going for. And they most likely are going to spend their money on the admission fee and food, not my book. It’s just reality which is why I groan anytime an excited individual has a story in mind that want my advice on how to get published. It’s really hard to get people to buy books these days, but its not to self-publish. Most consumers would either rather push electronic buttons or they are already overwhelmed with stuff and don’t need to find space on their home to store another product. So what does this story about me and the cancellation of the author visit have to do with my point? I was not taught how to say, “no” as I child. Rather I was taught to be co-dependent people pleaser. Worse was I had created a deep seated value that I was honoring God in the name of loving others because of this teaching and inappropriate interpretation of Bible verses like I Corinithians 9:19-23. I had confused Paul’s teaching that meant we should work hard to respect other’s differences so that we can to relate to them in their cultural/economic/sexual/racial context. It does not mean to become a door mat to be abused. I have also come to learn in my own odyssey of emotional healing and personal growth that healthy boundaries need to be taught to our youngsters as they are growing up. We need to applaud them when they do it and gently correct their childish self-preserving response to do so in a respectful way. Otherwise the natural reaction is to fight back which too often escalates the problem. Then the kids get hung up on taking justice into their own hands. One of the greatest and prevalent themes in the first 39 books of the Bible that consist of the Jewish Pentateuch, Prophets, Psalms, Proverbs, and other poetry that Jesus affirmed to be worthy of study and teaching is that God will avenge his enemies. It is to a believers honor to entrust that God will execute justice appropriately at the best time. It is not for us to demand now. Rather like Joseph (of which Dream Works produced Joseph King of Dreams) we can rise above negative experiences by trusting that they may be used to cultivate in each opportunities to grow and to mature in order to become a better blessing to others in the future. That’s why Joseph in Genesis 50:19-21 assured his brothers that he would not repay their wickedness with punishment but rather he would continue to preserve their lives and many others. Children have an innate pre-occupation with justice don’t they? We hear them cry out, “It’s not fair!” Perhaps they need to be inspired by what I just said in order to let it go. Otherwise if they hang on to the injustice it can fester to an emotional point that turns out to hurt themselves much worse than the original problem or offense. We need to as parents, teachers, leaders and therapists to listen to our children or patients to guide them into healing ways that will restore their damaged identity. Had I been feeling better about myself (respect), my book, writing, and known how to set better boundaries, I would have stayed firm and declined the November 3rd invitation from the start. That would have saved me the turmoil I went through every night of knowing it was too much, but not wanting to let go of the possibility that I might get my name out there, sells some books, and secure more author visits. Likewise it would have save the owner and manager the aggravation about planning on having me and then my canceling. So what is taught is very important because it leads to our values and ability to respond appropriately. This is what brings me to reformation leader, Martin Luther. Martin Luther was very much concerned about the teachings that were going on in 1517 that affect his parishioners’ identities. And he choose October 31st to set some boundaries about it making it know as Reformation Day . I happen to share Peter Smith’s (his article is the link in green above) speculation about as to why Martin Luther choose this day. So this October 31st my family will read more about Martin Luther’s brave move to take on Johann Tetzel’s manipulative message that bullied the common people of that day in the name of God, their deceased loved ones, and the church of the day . And then discuss how we might better believe that whether you are big or small, black or white, you matter because God made you with dignity, honor, and purpose that is redeemed through one very popular historic individual who lived an amazing life and died in the place of your shortcomings, weakness, failures, and vulnerabilities. He was called a man of sorrows and acquainted with grief because he took on all that pain that we struggle with in order to free us from how it binds us up to think poorly of ourselves and to succumb to believing unkind words about ourselves, to take personally disrespectful treatment, tolerate abusive working conditions, and therefore limp through life with depression and anxiety. So what will you celebrate this day? Happy October 31st the last day of National Bully Prevention Month! Do you want some live inspiration? Book Hope for an author visit for your class or youth group. Click on the home tab for more ideas of what she can do with and for your students. Local visits are just $150.00 which will be waved if your group buys 10 books. Out of town visits may include travel expenses.